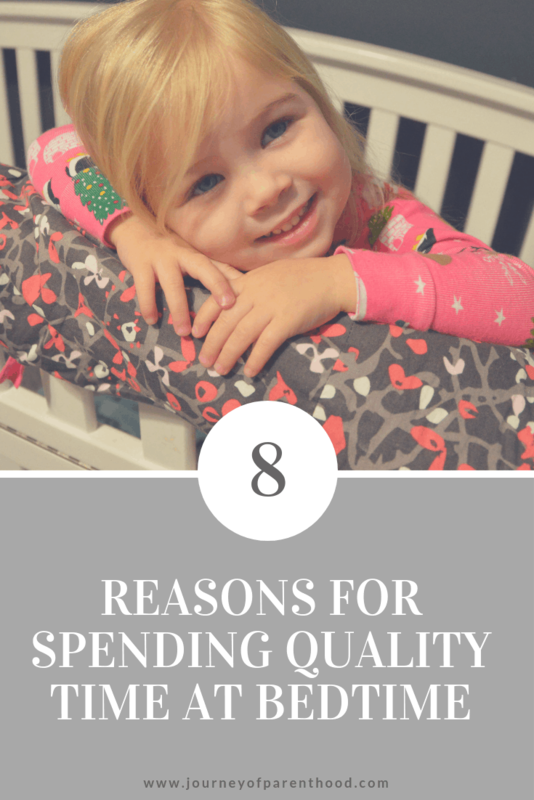 Bedtime for Kids: The Benefits of Quality Time. Life is busy. Our days are rushed. The kids get off the bus and it’s a blur of homework, sports, extracurriculars, church, dinner, baths, and bed. It leaves us, as mamas, feeling straight worn out and exhausted. Often I catch myself counting down the minutes until bedtime. I’m eager to get to my ME time. Time to relax and rejuvenate. It’s tempting to hurry through tucking-in the kids. A quick kiss, a grab of clothes for the next day, maybe a single line of their bedtime song and I’m out the door. But on those nights? Those nights where it’s all a big jumble of hurrying? I feel guilt and regret. I don’t fully enjoy that ME time I’m finally having because I know I missed out on the best part of the day – the quality time spent with each individual child. Here is what our bedtime routine looks like for our family. We have four kids and always begin the tuck-in ritual with the youngest then move up to the oldest. We aim for a story as a family, prayer time as a family and a family game once the baby is down for the night. Bedtime stories are an excellent tool to help children transition into bedtime and reading is so important for every age. We have many favorite family games we play together, you can see some of our favorites here! Even if our nights are too busy to make the story and/or game happen (like when there is a late sports game or church event) we will have the prayer in the car or an individual prayer with each child as we tuck them in. Each of our routines with our kids looks a little different. Zach has a song for each of the girls but not one for Kye. He is a little quicker with the tucking in but still has his own twist on making sure they feel loved and have quality time together with him. My routine is to pick out their clothes for the next day. I then sit with them in their bed and ask about their day, if there is anything on their mind or heart, what was their favorite part of the day or least favorite part. Depending on their moods sometimes I don’t have to ask any prompting questions. Sometimes they are chatty and desiring to talk so they chat away! Other times it takes more effort to get them sharing. And sometimes it’s more about me sharing – sometimes they have things they want to ask or know about me, or I have something on my mind or heart that I want to share with them. Once our talk time comes to an end I always sing our special song to them. Each of our kids has their own song and I snuggle with them while singing it. Then I give a kiss, remind them how much I love them, and head on out for the night. Just as we feel rushed throughout the day, kids do as well. It can be tough to move from the busyness of the day into the restful time of sleep. Sometimes kids can be pretty amped up and it can be hard to calm down. Taking the time to sit with them and go through their day and have that quality time together helps ease the transition from daytime to bedtime. It helps their bodies relax and their minds prepare for sleep. This is especially important for younger children. They don’t want to go to bed. They are the ones who will shed tears over it, beg for an extra story, come up with every excuse to avoid bedtime. The National Sleep Foundation discusses the importance of sleep for preschoolers in this post. While it’s tempting to give in and let them stay up a little later, every minute counts in reaping the benefits of a solid night of sleep. Getting into positive sleep habits will help a child set their internal clock, prevent night waking, and give them the healthy sleep they need. Finding the right time for them to go to bed will increase positive sleep patterns and deter early waking. Having a tuck-in routine helps kids move from playtime and fun time to bedtime and rest time. With my four-year-old, I use this time to talk about sleep. We go through a list of people who are all going to sleep. We may talk about animals who are going to sleep. Even about the sun going to sleep. If your child has fears this transition time can also help in that area. Let them talk through those concerns. Take the time to pray through their worries and help them with coping techniques to avoid bad dreams. You can read my post about helping kids conquer bad dreams here and my post on preventing childhood fears here! We have four children which makes it difficult to have quality time with each of them throughout the day. A big benefit of a set bedtime routine is that both they and I know that they will have that quality one-on-one time each night. They look forward to this special time. They know if something is on their hearts that they will have the opportunity to share it privately, uninterrupted from their siblings. Our oldest will often say “I’ll talk to you about it at bedtime.” This communicates to me that he doesn’t want his siblings hearing what is on his mind and lets me know how valuable that quality solo time is for him in his daily routine. While siblings are a blessing and a gift, children still need alone time with each parent. This allows them to fully bond with each parent and have their own unique relationship with Mommy as well as with Daddy. Spending quality time together at bedtime allows for those bonds to really form. My husband jokes that I spend hours tucking the kids into bed, but truly it’s only a few minutes. The four year old requires less time than the seven and nine years old kids do. And the 12 months old child takes even less time to tuck-in for the night before he’s fast asleep! It’s all about a balance and figuring out the needs of each individual child. Just as adults have love languages, so do children. And it can be difficult to meet your child’s love needs throughout the day. Older children spend most of their days at school and then the evenings at home can be so busy that taking time out to specifically give them love in the way they best receive it can be a struggle. Taking time in the evenings to have a tuck-in routine allows you to meet their love language needs in a private setting. If they are words of affirmation – this time is a great chance to tell them how much you love them, how proud of them you are, things you notice that are special about them. If their love language is quality time – this time together IS quality time. It’s time just you and them. Sitting down, really investing in that time you have together (no rushing allowed!) shows you value that time and that you love spending it with them. If they best receive love through acts of service you may start your tuck-in time by straightening up their room for them (no nagging comments allowed!) this gives them a nice clean room to wake up to the next morning but also shows your love for them by taking the time and putting in the effort to tidy up. If your child needs to be shown love through gift giving this would be a perfect opportunity to give them a special gift. Something small that made you think of them. A personal item of yours that you wanted them to have. A reward for hard work or efforts you’ve seen from them. And finally, if your child is a physical touch person then this tucking-in time is a perfect opportunity to snuggle close. Scratch their back as you talk, hold them in your arms while you sing, hold their hand while you listen to what they share. Bedtime for kids is the perfect time for expressing love in the ways children best receive it! You can learn more about your love language here and your children’s love languages here. This time together is an important time for children. There have been countless studies done showcasing the importance of listening to our kids. Asking questions but also hearing their answers. Giving them time in a private setting to open up. Share whatever may be on their hearts. For younger kids, this may look like simply asking their favorite part of the day and talking through that. Or who they played with on the playground. Or something that made them sad. Every conversation is an opportunity to listen but also to instill wisdom, knowledge, insight, and guidance. By starting these talks at young ages it will become a natural habit as they get older. As I mentioned earlier, my ten-year-old looks forward to this time each day. He craves it. I always, always want my kids to know they can count on me to be there for them for everything and through anything. I’ve always taken this bedtime to sit and listen to my children and I am already seeing the benefits of that investment in my pre-teen. He tells me everything and, more importantly, he wants to include me in all the details of his life. He feels comfortable even talking to me about tougher stuff – hard feelings, poor choices he’s made, areas in which he wants to improve. He feels safe. He trusts me. He knows I will give him my full attention, listen to his heart, and will always respond in love. This quality time at bedtime is priceless y’all. This is also such a good time to have “tougher talks.” There are always times in life where we experience harder seasons, things kids may need help coping with and working through. You can read my post on helping kids navigate through difficult situations here. I’m a big believer in talking things through with my kids and making sure they fully understand the lessons I’m teaching them throughout the day. Sometimes though there isn’t an opportunity to really talk things through fully. Maybe their siblings are around. Maybe we’re in a public place. Maybe the day is just BUSY and we can’t sit and talk at the moment. Because both the child and I know we will have that time to talk things through at bedtime. Not only is this a great chance to hit points I may not have been able to hit earlier, but it’s also a chance to go back over something of importance to make sure they truly have a full understanding. It’s also a chance to have some space from the initial situation. Perspective. Time to allow us both to think about whatever the situation was and allow us both to have a better discussion about it together. Sometimes time and distance from an event can allow for new thoughts and ideas to form and having this time together allows those thoughts to be shared. Often to this is a time for me to “lessen the blow” or apologize when needed for how I handled a situation initially. For example, maybe our older daughter hit our younger daughter at some point in the day. During the moment a consequence was given and we all moved on. That night when tucking in the older daughter I may use that time as a chance to get her feelings on it, brainstorm ways to avoid hitting in the future and remind her that we all make mistakes and that she’s forgiven and loved. Or maybe during the hitting scene I lost my cool. I was busy making dinner when their argument occurred. Maybe I didn’t fully listen to both sides, fully take into account everything that occurred. Our time at tuck-in time could include an apology from me. For how I handled it at the moment and provide an opportunity to better handle it then. 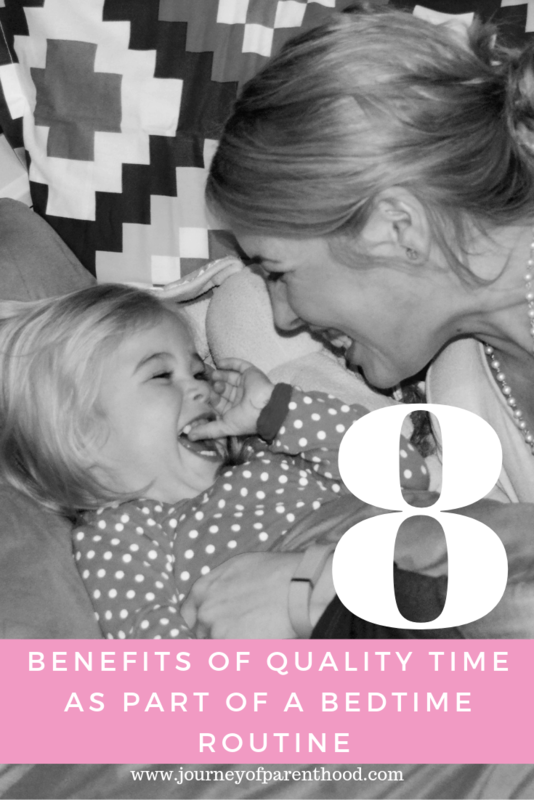 So many of the reasons to spend quality time with your kids at night before bed benefit the child, but having this time also benefits you as their mother. I’m able to then spend my evening doing things I enjoy and I go to bed at night with a happy heart and a content mind knowing I gave each of my children my time. I spent time pouring into them. Meeting their needs. Connecting with them on their level. Spending quality time with each of my children before they go to sleep allows me to avoid feeling the “mom guilt” and feel more connected and more bonded in my relationships with my children! It ensures that I know each of them as individuals and that I have a special, unique bond with each of them as well. The time spent together at tuck-in doesn’t have to be long-lasting. Some nights it may need to be. Conversations may take time and one child may need more of your time than another on any given night. But many nights it is under 5-10 minutes to complete the entire tuck-in process for each child. Don’t over think it or set some bar that will feel hard to reach. The important thing is giving your child your undivided attention for those few minutes before they go to sleep for the night (or for naps if they are still napping…I do a similar routine with my four-year-old at naptime). Some nights the tuck-in routine may not be able to happen at all. And that’s okay too. By having a consistent bedtime schedule and routine the tucking-in system becomes the norm and overrides the times where it’s just not able to happen! What time should kids go to bed? Bedtimes for children can vary family by family. Age appropriate bedtimes are important to consider. In our nightly ritual, I tuck in the baby (toddler) first at 7:00 then the four-year-old (preschooler) at 7:15, the 7-year-old at 7:30 and then the 10-year-old at 7:45. Make a routine you can stick to and create a pattern your children can rely on for their bedtime most nights. Keep a solid nightly routine that your children can trust and rely on in order to know they will get the attention, care, and sleep they need! How do you handle his nap time and needing to pick up your older kids from school?